This page was last revised on Feb. 25, 2019. ALICE FRYER HALL (1904-1996), a teacher and journalist, moved to Zephyrhills in 1941. She was a member of the Chamber of Commerce, Garden Club, veteran’s associations and the Democratic Party. She devoted herself to bringing a hospital to the community, which she did in the 1980s. She then raised $750,000 for state-of-the-art cardiovascular equipment. In the early 1970s she helped open the community’s first nursing home. Hall supported the establishment of parks, museums and a rescue squad in Zephyrhills. She was born in Mississippi. BENJAMIN M. HAMPTON (1841-1939) came to Florida in 1890 "in search of relief from a severe attack of rheumatism," settling in Avon Park. Upon recovering, he traveled to Colorado and Colorado in search for gold. He subsequently returned to Florida, coming to New Port Richey in 1918, when he planted a ten-acre orange grove, even though he was approaching 80. He was known locally as "the rancher of Rancho Glen Haven." He planted a new grove on his 91st birthday and lived to pick much citrus from his new grove before he died at age 98. He was born in West Philadelphia (later Fairmont Park), Pennsylvania, and he fought for the Union in the Civil War. In 1929 he said that one of his most treasured memories was seeing and hearing Abraham Lincoln. GEORGE J. HANCOCK (1857-1929) was born near Hancock Lake. He married Mary Frances Jackson of San Antonio. His black-bordered obituary in the Pasco County News said, "In all Pasco County there was not a man more widely known nor better loved than George Hancock. He is a living personification of the old time Southern hospitality." He died on May 3, 1929, at his home in the Darby neighborhood and was buried at Townsend House Cemetery. His children were Henry, J. Ward, and Mrs. Ida Campbell. HORACE JACKSON HANCOCK (1862-1914) married Alatha Frances Nicks (1876-1949) in 1895 in Brooksville. Alatha Frances Nicks, who went by Frances, was born April 29, 1876, in Brooksville, and died March 25, 1949, Tarpon Springs. They are both buried at Townsend House Cemetery. Frances never remarried. This information comes from their grandson Steven Hancock, who writes, "Alatha and Horace Hancock lived on a farm on the south shore of Hancock Lake down the lane from Townsend House Cemetery, so technically they lived in Pasco County, but just barely. Their sons George (b. 1898) and Robert (b. 1902, my father) were born out there." 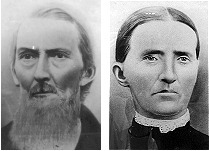 A picture showing Horace and Alatha on the farm is here and a picture of Horace Hancock with H. R. Nicks is here. George Harshaw owned most of the property north of the Anclote River (Alt. 19) between the river and Dixie Hwy (Alt. 19 today). There is now a Tarpon Springs wildlife park where the homestead used to be. As a kid, I used to play in that old house. One of his daughters, Laura, married Peter Kapsalis and they had a dairy on the northwest side of the river and Alt. 19. One of the old dipping vats is next to my property. My father used to help round up the cows for them. My father also used to herd cattle for Sam Mickler along with his son Bart. Daddy said that sometimes they worked as far north as Main St. in New Port Richey (on the east side). When they were up that far, they would tie their horses up at the Hacienda Hotel and eat lunch there for a quarter. JOHN GORDON HATCHER (1885-1945) was born in Levy County. He married Lizzie Tillis (1892-1950) in 1909. He lived in Cedar Key, Webster, Groveland, and Tarry Town before moving to Hudson in 1920. He worked in the fishing industry. According to his obituary he was prominent in the affairs of the Hudson community. Lizzie was murdered by her second husband, who subsequently committed suicide. HATCHER, SALEM B., 89, of Hudson, died Wednesday (Dec. 20, 1989) at HCA Bayonet Point/Hudson Medical Center. Born in Bronson, he came here 67 years ago from Miami. He was a retired commercial fisherman and a Presbyterian. He was a World War I Navy veteran and a member of Veterans of Foreign Wars Post 6180, Port Richey. Survivors include his wife, Eda; four sons, Paul and Andy, both of New Port Richey, Austin and Calvin, both of Hudson; two daughters, Vada Keller, Wilmington, N.C., and Eleanor Pratt, Crystal River; 19 grandchildren; and 18 great-grandchildren. Wellwood Funeral Home, Hudson. The following is from West Pasco’s Heritage, by Julie Obenreder. Salem Hatcher arrived in Hudson from Levy County in 1922. The first job obtained was working for the county building roads, filling swamp areas along Route 52, later worked on the construction of the road from Aripeka to Hudson. In 1925 when the boom sent wages sky-rocketing in New Port Richey he took advantage of it and went to work for Bragge Contractor in the city. He married Eda Collum, formerly of Georgia, in 1929. Eda recalls her first impressions of Hudson. There were thirty two homes in the town in 1929. The old Kentucky Inn, built in 1910, located on old Highway 19 which wound along the Gulf, had a heavy black iron fence surrounding the two story frame building and a large square cupola was a landmark on the top of the Inn. The room rate was three dollars per month. She and Salem stayed there for a time after their marriage and in the year 1943 they purchased this building and reside there today. The fence and cupola are gone but otherwise the house remains virtually unchanged. Highway 19, of course, has been relocated and the house address is now Main Street, Hudson. Salem also remembers the prohibition days when boats brought illegal whiskey from Cuba and Bimini. The men would bring the boats in to the bayous around Hudson, tie six quarts of whiskey in each bag, put it overboard, it would sink and remain concealed from the Coast Guard Revenue Representatives. They finally did catch one boat, “The Roving Gambler,” in the bayou and this led to the slowing of the whiskey traffic for a time. Horse Island, about two and one-half miles north Of Hudson, was a large fish camp where eight fishermen made their home. A turtle weighing five hundred pounds was brought in with one catch. Eda says it is delicious when sliced and cooked as you would a steak. Salem had a boat and did some sponging in the 1940’s. He used a hook to pull the sponge from the waters which were plentiful at a depth of eighteen feet. But in 1946 the sponge beds were depleted and the sponge industry ceased in the Hudson area. Salem and Eda had nine children. Three reside in New Port Richey, two in Hudson. Nan Lefils (daughter) is a New Port Richey Councilwoman - 1973-74. Jefferson (Jesse) Taylor (1850-1928), q.v. Ella Mae, b. Mar. 1891; d. Mar. 1, 1994; m. Henry Patterson (d. 1971) in 1970; no children. A Henry Patterson, presumably this one, was born Jan. 30, 1906, and died in Tarpon Springs in July 1971. This document was provided by Laurie Baker. Another recollection of Ella Mae Hay Patterson is on the Sapling Woods page. I was born three or four miles east of Port Richey. I was descended from Abraham and Sarah Hay, who lived north of Hudson and are buried there. My father, William Byrd Hay, was a Civil War Veteran. When I was about five years old, my father died. My brother, Olan, was about seven years old then. My sister, Sadie (Sallie) was about six years old and my youngest sister, Mattie Parker, was about six weeks old. When my mother’s mother died, Uncle Sam and Aunt Lizzie Baker took my mother to raise, as they had no daughters living. Several times when I was young, we visited Uncle Sam and Aunt Lizzie at Bailey’s Bluff and Elfers (known as Sapling Woods then). My mother, Mary (or Mayme as she was called) took us by horse and wagon and we especially liked to go to Bailey’s Bluff because then we could go swimming. At Bailey’s Bluff they called the place the sponge crawls, where the sponge fishermen cured the sponges to sell. When we visited them there, Uncle Sam had a store and lived either in or near there. When we visited our aunt and uncle at Sapling Woods, (Elfers) I always went right to the bookcase to look at the books. While others play, I loved the books. My mother predicted then that I would be a teacher; but I loudly denied that. I especially liked the pictures in the Bible, even the gruesome ones like Absolom hung in the tree. In the kitchen at the Baker House which was separate and on the east side of the house, was a big dining room table in the middle of the room. In the corner was a "pie-safe", screened in front. Aunt Lizzie made light bread. When her grandchildren came, they asked for this, but my mother said this was not nice and we must never ask for things. I was glad when we came at the same time as the grandchildren, because we received some also. I especially remember Mayme and Badge Baker. Once when we were traveling to visit the Bakers at Sapling Woods, the horse stopped and lay down and would not get up, or balked. Someone living nearby came over and invited us to spend the rest of the day and the night at his home, and probably the horse would get up in the morning—which he did. This Baker House faced west and there was a porch across the front. We slept upstairs when we visited there. The children usually slept on pallets on the floor. Again, regarding my relationship to Samuel Baker, he was my mother’s father’s brother. They had all lived in Key West, where my mother was born. When it was time for us to go to school, we moved to Sapling Woods. The building was called something like Gulliford. When I was very sick, I remember Miss Sue Baillie helping care for me. I remember Mrs. Pinkie Brown, who had two daughters, Vassie and Rene. We liked to visit at their house. We moved to Hudson soon after and I finished the eighth grade in school there. A Hudson teacher, Miss Fannie Mobley, invited me to go to Dade City to live with her and her family, which I did for seven years. I taught school six months in the winter and worked in the tax collector’s office in the summer. Both Fannie’s father and sister Mattie were tax collectors for Pasco County at one time. I attended Professor Kar’s [Corr’s] Normal School and obtained a teaching certificate before I had even graduated from high school. About 1912 or 1913, I went to Tallahassee to college for one year. Cedora Futch and I lived together in the dormitory there. I taught in various schools, Ormond Beach, Arcadia, Plant City and Tampa. I was teaching when I remember Hillsborough and Pinellas County being divided. Meantime, my brother Olan died while in the service (of flu) and my mother moved to Tarpon Springs. I worked in the citrus packing house at Ozona, and then started teaching in Tarpon Springs (about 1924). I retired from teaching in June, 1962, after teaching 47 years. Most of the time, I taught second grade. My mother died in 1949. My sister Mattie married Louis Smitzes and died of heart trouble in 1971. Sister Sadie was in a nursing home from about 1964 to 1971, when she died. In 1970, I married Henry Patterson and continued to live on in the home place. My husband, Henry, only lived a year and a half after we were married, and passed away from a heart attack in 1971. Now I enjoy the companionship of my cat, Baby, who can be quite bossy at times! Ida Mioma Hay Mitchell, q.v. According to Ash, they had five children. Thus some of the above names could represent the same person. J. HARVEY HENDERSON (died 1959, age 78) was born in Goodman, Miss. He was a state plant board inspector. His brother was Homer C. Henderson, q.v. John Marvin, b. Sept. 11, 1908, Hudson, Fla.; graduated from Gulf High School in 1928; m1. Kathryn Craig (b. Marion, Ala.) on June 23, 1935, at Dade City. She graduated from GHS in 1926. m2. Margaret Flowers Weitzel; d. Sept. 16, 2008, Albemarle, N. C.
ROSCOE BUSH HENDERSON (1906-1998) owned and operated Roscoe’s Rexall Drug Store in New Port Richey for twenty years until he retired in 1960. He was born in Hudson. His family moved to Zephyrhills in 1915, then to Tarpon Springs, and then to Elfers in 1916. Roscoe Henderson was the valedictorian of the first graduating class of Gulf High School in 1924. School board records show him as a 21-year-old teacher at Gulf High School in the 1928-29 school year. In 1946 he moved to New Port Richey. JEFFERSON ALEXIS HENDLEY (1854-1947) was a member of the Florida Constitutional Convention of 1885. He was born in Farmington, Kentucky, and graduated from Neophogen College and Washington and Lee University. He wrote that he began practicing law at age 14 and that in 1879 he moved to Texas, where he organized Mitchell county and was elected its first prosecuting attorney. He later moved to Florida, settling north of Blanton. In 1883 he was elected county surveyor of Hernando County. In 1886 he married Dolly Maynard of Perryville, Indiana. He was one of the organizers of the Bank of Pasco County. He was elected to the state senate in 1896. In the 1930s he wrote a series of newspaper articles on the history of Pasco County which were published in book form about 1943, when he was living in Dade City. A newspaper article about Hendley is here. BENJAMIN HELMAR HERMANSON (1868-1944), according to a 1929 newspaper article, started the first store in New Port Richey, a hardware store, on the Boulevard, in 1914, and started a drug store next door to the hardware store in 1915. In a letter to the Port Richey Company dated Aug. 20, 1912, Hermanson wrote, "I have been in Cuba for five years raising fruit and vegetables, but found that Cuba was too far south to raise good grapefruit so decided to move to Florida. Last Fall I traveled South Florida, first along the East Coast, then inland and the West Coast from Ft Meyers to Port Richey. I was looking for an ideal location for fruit and truck gardening and found it at Port Richey, where I bought fifty acres on the Gulf Coast." He worked in real estate, helped organize the local Masonic lodge, and organized the first band in the community. He served on the New Port Richey city council for 12 years. A 1923 newspaper article reported that Hermanson was traveling to Cuba to inspect a tobacco plantation he owned there. According to a newspaper article at the time of his death, he was born in Minnesota and came to the area in 1912. According to a 1930 obituary of his wife, he came to what is now New Port Richey in 1911. A 1929 newspaper article about him stated he was born in Calumet, Michigan, and was taken to Finland when he was a few days old. In 1900 he married Louisa Putkomen (1863-1930), who was born in Viborg, Finland, according to her obituary. OSCAR WILLIAM HERMS (1872-1947) operated a horticulture business, shipping his product to Northern markets. An article in the New Port Richey Post in Jan. 1916 reported that he came here from Portsmouth, Ohio, about three years earlier, having operated a similar business there. He was a member of the first New Port Richey City Council. According to his obituary, he married Ruby Eugene Clark (1887-1950) at the Clark home, which later became the Bay-Lea Inn, on June 30, 1912. He taught the Methodist Sunday school in Port Richey in 1915 and 1916. He was vice president of the First State Bank in New Port Richey and was on its board of directors. He was and a deacon of the Community church. The 1920 census shows they had two children, Louise and Clara. The 1930 census shows Oscar Herms' brother, Charles F. Herms (d. 1932), and his wife, Minnie M., were living nearby on Dixie Blvd. In 1936 Herms moved his business to Tarpon Springs. Elvina (Vinie), m. Mickael Knowles Jr. about 1913. Elisha Allen (1833-1907), born in Leon County. He married Mary Ann; they divorced about 1869. He subsequently married Eunicy Ann Carroll. After Eunicy died, he married Emma Olivia Roberts. Mary Ann Jane Cooper Hill married Daniel Orr and moved to Hillsborough Co. She died 1897 and was the first grave in the County Line Cemetery (aka the Willie Grantham Cemetery) on the south side of County Line Rd. between Cypress Creek Rd. and Livingston Ave.
Thomas J. (1838-1864), m. Sarah Ann Elizabeth Cooper (b. 1844, in Georgia) on Jan. 8, 1858, in Hernando County. Thomas died on Feb. 20, 1864, at the Battle of Olustee. After he died, she married Joseph Miller. Amanda (1843- ? ), m. Columbus Alexander. They had a daughter Elizabeth and a son Thomas Rutherford Alexander, q.v. MALCOLM NICHOLSON HILL (1844-1936) and his wife Emma E. Hancock (1848-1916) were among the earliest settlers in the Port Richey area. Malcolm Hill was born on Nov. 3, 1844, in Marion County. He is shown in the list of Hernando County voters from 1865 (although this included what is now Pasco County). In the 1870 census, he is shown in Cedar Tree (post office), which is in the part of Hernando County which became Pasco County. In 1872 he married Emma E. Hancock. In the 1880 census and 1900 census he is shown as a farmer in Hudson. In the 1910 and 1920 censuses he is shown as living in Tarpon Springs. Aaron McLaughlin Richey’s daughter recalled that “Mrs. Malcolm Hill was the other woman in that section, and she lived some distance away.” According to several sources, in 1881 Hill moved from Brooksville to what would become New Port Richey. According to a 1935 newspaper article, he moved to Tarpon Springs in 1903, but according to a 1932 Tarpon Springs Leader article, he moved to Tarpon Springs in February 1908. According to F. C. Mallett, Hill was discharged at Appomattox along with James Washington Clark; they remained friends for the remainder of their lives. History of Tarpon Springs (1964) has: “Malcolm Hill, at the risk of his life, went to the rescue of Capt. Sam Hope on the battlefield in 1863 and brought him to safety.” Some researchers are skeptical of this claim. The Tarpon Springs Leader spelled his middle name Nickelson. Malcolm M. Hill, a native of Florida, came hither at about the time that James W. Clark, Sr., came. With his came his wife, whose maiden name was Emma E. Hancock. They made their home on what is now the Casson property on Massachusetts avenue. They had six children, one of whom, George, is dead. The others, Thomas J., John T., Clarence M., Carrie E., and Alice (now Mrs. Henry Nicks) are living. Mr. Malcolm Hill now lives in Tarpon Springs. Thomas J. (1872-1947), a prominent resident of Elfers (see below). Clarence M. (1875-1949), who was a marshal of Tarpon Springs. Carrie E. (d. 1949), known as Aunt Cap'n. She was a practical nurse. Forrest Dell (1906-1983), m. Lillie Mae Burney. A son, Forrest Dell Jr., graduated from Gulf High in 1965. CHARLES HOWORTH HIMMELWRIGHT (1871-1942) was a citrus grower for 22 years. He came to the Dade City area from Doylestown, Pa., in 1919, and purchased grove property which he and his son Fred L. developed into one of the finest groves in the county. He was born in Chester, Pa. He was married to Mrs. Ida Evelyn Himmelwright. Their children included Mrs. Harry T. Lucas of Ashland, Va., and Fred L. Himmelwright of Dade City. JOSEPH STANTON HODGES (1880-1950) came to New Port Richey from Quitman, Ga., in 1929, according to his obituary, and managed the C. S. Register Grocery in the Arcade Building for 18 years. His wife was Clemmie Leithan Hodges (1886-1981). His obituary listed his surviving children as Mrs. Howard Hodson of St. Petersburg, Mrs. Henry Williams of New Port Richey, and Mrs. John Zoffay of Frostproof. A son Lamar (1909-1946) was killed in an automobile accident. CHARLES HOFFMAN (d. 1939) was the first mayor of Port Richey, taking office in 1925 when the city was incorporated. He was named Mayor in the charter, and was not elected. He came to New Port Richey about 1919 and was chosen vice president of the Avery Library in 1919. He was born in Michigan, and was a Michigan organizer of Theodore Roosevelt’s 1912 Bull Moose campaign. In 1924 he was elected secretary-treasurer of the Florida Progressive Party meeting in Orlando. In 1926 he opened the Poole-Hoffman Drug Co. in New Port Richey. In 1926 he was secretary of the New Port Richey Chamber of Commerce. In 1927 he was president of the City Club and was the toastmaster for the opening of the Hacienda Hotel in New Port Richey. He died on Feb. 15, 1939. His wife, shown as Effa or Effie Barbara, was born in 1863 and died on March 26, 1940, at Tampa. GEORGE HOLLAND (died in 1929, age 74) was a regular winter resident of New Port Richey beginning in 1915. The New Port Richey Press reported on May 1, 1925, that he was sworn in as city tax assessor. According to a 1929 newspaper article, he was born in Alden, N. Y., and had been the assessor in Sidney Township, Michigan, for 34 years. MILLS HOLLOMAN (1795?-1882) was a free black man apparently living in what is now eastern Pasco County in the 1840s and 1850s. On Dec. 14, 1842, Mills Holliman (sic) applied for a homestead permit. A permit was issued on January 23, 1843, for property located in the Chicuchatta Hammock, specific location unknown at this time. This permit and final deed were eventually denied and he did not receive title to the property. The reason stated was “Refused on account of his color, (not white).” The Armed Occupation Act of 1842 did not allow non-whites to apply for land. He is shown as paying taxes as a free man of color in Benton (Hernando) County from 1845-1856. The 1850 census shows him a 50-year-old farmer born in North Carolina and living in the Buddy Lake Settlement census district. In 1857-58 Holloman’s tax was paid by his guardian Nathaniel Moody. The 1860 census shows him age 64, born Virginia. In 1860 Tampa attorney James Gettis was listed as his agent. In 1863 Gettis was listed as his guardian. The 1870 census shows Holloman as 60 years old, white, born in Florida, using the Cedar Tree post office. Florida’s Black Public Officials 1867-1924 has: “Born 1795, Virginia. Mulatto. Farmer. Died January 6, 1882, Hillsborough County, Florida. Hillsborough County Commissioner 1868-70, 1870-71.” A son, Adam Holloman (1830-1905), also served on the Hillsborough County Commission. Adam’s daughter Margaret married Levin Armwood in 1878. Information provided by Jeff Cannon and Dan Perez. More information is here. JOHN G. HOLZSCHEITER (died, 1939, age 77) was a large property holder in the area and an early justice of the peace. He was a president of the city council and acting mayor of Port Richey and the first president of the Board of Trade which was organized during the winter of 1915-1916. He was from Kansas City, but was born in Germany. Some information provided by Hope (Griffin) Adkins. For information on earlier Hopes, see the Hernando page. JOHN JOSEPH HOWELL (1848-1915) settled near Fort Dade in 1865. In 1869 he married Sarah Elizabeth Smith. A daughter Rachel (1891-1938) married Francis Behring Kirman (1879-1955). Rachel Kirkman taught school at Trilby, the New Port Richey elementary school, and Gulf High School. More information on this family is on the Blanton page. The late Hill Williams Howse ... moved from North Carolina to Ocala immediately after the Civil War, purchasing from the government a large tract which included Silver Springs. He was active in the early beginnings of the Ocala area, building and operating a sawmill, a cotton gin, the Palatka-to-Brooksville stage line and, in later years, represented his district in the Florida State Senate. He also constructed Ocala’s first hotel. Sallie (b. 1875) is shown as age 11 in the 1885 census. Samuel Oliver "Knott" Howse (1877-1965) is shown as 10 years old in the 1885 census. He was living at Anclote in 1900, married to Florida Anna Baillie (b. Feb. 10, 1878; d. Feb. 5, 1941). They married by 1899. In the 1910 census of Hillsboro County he is shown as a ship’s carpenter, 33 years old with wife Annie, 32, and Ellen May, 8, Kora J., 6, Irene, 4, and James, 2. His second marriage was to Freda Margaret (b. Sept. 27, 1881; d. Jan. 31, 1954). He was living in Port Richey when he died. He is buried at East Elfers Cemetery. James B. Howse (age 4 in the 1860 census) is shown in the same household as Hill Howse in the 1860 and 1870 censuses. He was a postmaster at Silver Springs. SIMEON F. HUCKABAY (died, 1929, age 70) came to Dade City from Dawson, Ga., in 1884, according to his obituary, and was engaged in the mercantile business there from that time. He was survived by his wife, three daughters, Mrs. Catherine McIntosh and Mrs. W. M. Gast, both of Dade City, Mrs. W. M. Hetherington of Plant City, and two sons, W. W. Huckabay and S. F. Huckabay Jr.
ISAAC WASHINGTON HUDSON SR. (1825-1892) married Amanda Luverna Cobb (1831-1922) on Nov. 9, 1848, in Marion Co. Georgia. They were parents of 11 children, 9 of whom reached adulthood and married. They left Alabama in 1868, locating first in Madison County, Florida. In 1870 they moved further south to the Chipco settlement, near what is now Blanton. Chills and fever from the undrained swamps and bayheads around Chipco and Hudson’s bronchial trouble caused the family to seek the salt air of the Gulf. They arrived at what would become Hudson in late 1877 or early 1878. (Isaac W. Hudson Jr., who was born on Nov. 17, 1870, said that he was a little over seven years old when they arrived at Hudson. Hendley gives February 1878. The obituary of Amanda says they arrived in 1878.) Hudson provided quarters in his home for the post office, with John William Hudson (1859-1927) named the first postmaster and Joseph Byrd Hudson (1856-1950) named his assistant. I. W. Hudson Sr. prospered through a shipping trade to Cedar Keys and was able to buy 200 acres of land from the state at $1.25 per acre. He employed Henry Clay Bush to survey and plot the town site. Many of the present day streets in Hudson bear the name of Hudson’s wife and children. According to Ash, about 1890, Joseph Byrd Hudson (1856-1950) and William Hudson established the first mercantile business in Hudson. Isaac Washington Hudson Sr. was born in Laurens or Monroe County, Georgia, on May 15, 1825, and died in Hudson on Aug. 3, 1892. Amanda L. Hudson died at the home of her daughter in Dade City and was buried there. According to Stanaback, "Some of his neighbors were Mr. Worley, Jess, William, and Joseph Hay, W. D. Frierson, Bill Land, William Bailey, Bill Tillett, Crockett Whidden, Sam Stevenson, Bug Stevenson, Allen Hill, Malcolm Hill, and Hill House." “For 20 years my father was an invalid, with Cough and Bronchitis, and tried everything he could hear of without obtaining more than temporary relief. Being advised of Parker’s Tonic, he began to use it, and before he had taken five dollars worth was cured. He is 57 years old, and has been well now over a year.”—Jos. B. HUDSON, Hudson, Fla.
Isaac W. Hudson was a man of the old school. His house was open to all without charge. We candidates running for different offices traveled in buggies and on horse, dragging through sand and mud would camp out until we reached Mr. Hudson’s. He would house a dozen of us in some way, feed us on fish, cornbread, and coffee, and would not take a cent from any of us. ISAAC WASHINGTON HUDSON JR. (1870-1972) was the seventh of eight sons of I. W. Hudson Sr. He was born at Chipco. He attended school at Clear Lake, now Lake Jovita, living with the J. L. Portner family. He recalled in a 1952 interview the log house where school was held three months of the year. His teacher was a Mr. Benson. His father and brothers planted corn, sweet potatoes, sugar cane, peas and peanuts, not only to feed the family but to produce good hog meat, which was their main crop. According to a 1972 newspaper article, “At 20, he returned to East Pasco to attend Ft. Dade Academy near Lake Jovita, but he walked all the way back to West Pasco to court Miss Nettie Elizabeth Hay, carrying his shoes in hand to save wearing them out. At 25 he married her at Vereen in the Hudson area.” Nettie was a daughter of J. T. Hay; Isaac had known her since he was 3 years old. They first lived at Hudson but later moved to Elfers. At age 35 he was elected a Pasco County commissioner. He was defeated in a race for Sheriff by Bart D. Sturkie in 1908 and 1912, the second time by 48 votes. In 1916 he was elected Sheriff. He lost again to Sturkie in 1920, but was re-elected sheriff in 1924. In 1928 he lost a bid for re-election to C. E. Dowling. This information is from Ash. On Dec. 28, 1917, Sheriff Hudson sprung the trap door as Edgar London was executed by hanging at the old Dade City jail. It was the second and of two legal hangings in Pasco County history. In his first six months in office, Sheriff Hudson raided 164 moonshine stills and put them out of business, according to the recollection of a son, Leon. Hudson died on Oct. 16, 1972, one month prior to his 102nd birthday. Hudson had three sons, one of whom, Leon (b., Aug. 6, 1900), became the Police Chief in Dade City in 1951. Another son was Elzie (1899-1981), who was a sheriff's deputy in 1925. CLAUDE WILLIS HUDSON (1893-1976) married Lucy Daniels of Stonewall, N. C., in North Carolina in 1921. They had met when Lucy lived in the Port Richey area. They lived at 126 W. Montana Ave. Claude was a lifelong resident of Pasco County. He was born on Jan. 10, 1893, and died on Oct. 3, 1976. Children: Claude Jr., q.v. ; Norma Mae (b. 1922, m. Melvin Draft, d. 1983); Joseph Earl (m. Shirley Casper); Sylvia (m. Holmes). An audience estimated at over 500 persons gathered from all sections of Pasco, Hillsborough, Pinellas, Citrus and Hernando counties, at historic Mount Zion cemetery in the Fort Dade Section Sunday afternoon to pay last honors to the memory of John William Hudson, well known pioneer resident and farmer, whose death in a Tampa hospital Saturday from blood poisoning shocked this entire section. Services were conducted by the Rev. J. M. Mitchell of Elfers, a life long friend, and interment was in charge of Mortician Edgar Rawls of the Coleman and Ferguson Company of this city. Probably none of the few remaining pioneer residents of Pasco county was better known than Mr. Hudson. He was one of the leading farmers of this section, active in all lines tending to develop the agricultural development of the county. Quiet and unassuming, he was a man of sterling character, who gained and held the respect of all with whom he came in contact. John William Hudson was born in Andalusia, Ala., May 29, 1859, and had just passed his 68th birthday when death called him. As a boy he came to Florida with his parents in 1868, the family locating at Madison where they remained for one year, then moving to what was known as the Chipco section of w hat is now Pasco county, near the present town of Blanton. Here they lived, suffering the hardships of pioneer days for ten years, when they moved to the west coast and founded the present community of Hudson. Mr. Hudson grew up on the farm, gaining such education as was possible from the schools of that day. For ten years he served as postmaster of the community, the only political office he ever held, or sought. On July 3, 1890, he was married to Miss Sarah Jane Fortner of Fort Dade, who survives him. In 1892 Mr. Hudson moved to the Fort Dade section, where he developed the leading farm in that section, and one of the best in the county, and on which home until his death. Mr. Hudson’s death was caused by an infection in his foot, caused by the warm weather, which developed into blood poisoning. Up until Thursday of last week his condition was not considered serious, and his removal at that time to Cook’s sanitarium, Tampa, was more in order that he might receive better treatment, than because it was thought his life was in danger. Up to Saturday morning, reports received from him were that he was improving, and his death about noon was a sudden and unexpected shock. Besides his widow Mr. Hudson is survived by two daughters, Misses Mildred and Mabel Hudson, one son Dewey Hudson all of Fort Dade, two sisters, Mrs. Mary Osborne of Kissimmee and Mrs. J. A. Mobley of Dade City, and five brothers, T. Byrd and Alfred L. Hudson of Hudson, James Thomas Hudson of Inglis, Wyley A. Hudson of Clearwater and Isaac W. Hudson of Dade City. His remains were carried to their last resting place by the following old friends and neighbors, who acted as pall bearers: Judge O. L. Dayton, Judge J. W. Sanders, Jasper C. Carter, W. S. Larkin Sr., F. N. Ruger, and Harry Haywood. Hershel, b. March 7, 1917, deceased. Children: Paul, Elaine. JAMES WILLIAM HUFF (1840-1927) was a Medal of Honor winner who lived the last eight years of his life in New Port Richey. He is buried in Pine Hill Cemetery. Huff was awarded the medal on April 12, 1875, for “valiant conduct against the Apaches during the winter of 1872-1873.” He was a sergeant in Company L of the 1st U. S. Cavalry. He was born Feb. 2, 1840, in Washington, Pa., and died Nov. 30, 1927, in Port Richey. His wife was Taliea Eva Bayer; they had two sons, Edgar and James, and three daughters, Lucy, Josephine, and Taliea.